Sign in using the Forum login form. If you are not a member, register for a free account. Your name will appear on the 'Players' list after you submit picks. DISCLAIMER: This Football Pool is intended for recreational purposes only and is not for profit. 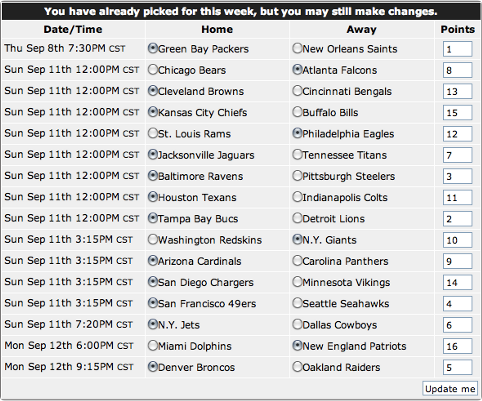 The deadline for your pick selections each week will depend on when the first game of that week is played. But make no mistake, all player picks MUST be in one hour before game time of the first game of any given week! No picks will be accepted after kick-off of the first game on any given week. NO EXCEPTIONS!! We do not use the SPREAD. If there are n games in a week you get to make picks from 1 to n, using each number only once. If the team wins, you get to add the number of points you had on that game to your grand total for the week, so it makes sense to put the higher point values on games you are more sure of. The leader board is a cummulative sum of your weekly scores. The person with the most points at the end wins.